The Ministry of Natural Resources and Environment (MONRE) has recently introduced a raft of draft amendments to the 2013 Land Law. According to the MONRE, several shortcomings have been revealed after three years’ implementation of the Land Law. Access to land remains a problem hindering the improvement of the country’s investment environment and the development of the business circle. Land use efficiency remains low. Corruptive practices, self-seeking acts and under-collection of state budget revenues still exist in the land management sector. Land-related complaints and denunciations continue to be complicated, posing a threat to public security. In addition, the process of agricultural land accumulation and concentration takes a slow pace, discouraging investment in agriculture. “Hence, the 2013 Land Law should be revised to meet socio-economic development requirements in the new period,” the MONRE argued. The revision would focus on several major issues, including the agricultural land management and use mechanism, land recovery, change of land use purposes, and land pricing. The MONRE proposes two options on the quota for acquisition of agricultural land. In the first option, the farmland acquisition quota, which currently ranges between 30 hectares and 550 hectares per farmer or farming household depending on land use purposes, would be increased by 10 times. As per the second option, such quota would be abolished. The MONRE supports the second option but admits that such option, if selected, might give rise to some negative practices. As explained by the MONRE, the abolishment of the farmland acquisition quota would help ensure households’ and individuals’ access to agricultural land in conformity with their demand and capacity, thus breaking down the existing bottleneck in agricultural development for the time being. However, there remain some worries about this option. Experts warned that one might abuse the eradication of the land acquisition quota to accumulate and speculate land and consequently, not a few farmers would become landless. 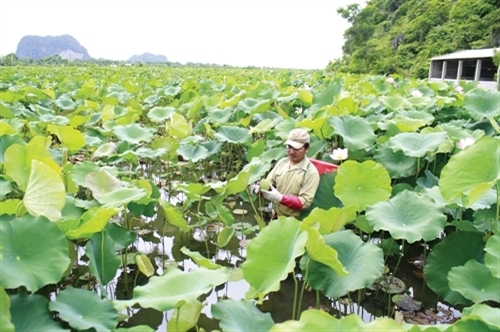 Top leader of MONRE Tran Hong Ha, in an interview with the Vietnam Economic Times newspaper, said: “Land constitutes a political-economic-social topic. The settlement of land-related issues, including land accumulation and concentration policies, should deal with all these aspects”. “There should be comprehensive solutions to regulate the multilateral relationship among agriculture, farmers and rural areas such as rural economic restructuring, and building appropriate models and methods of coordination among farmers and between farmers and businesses,” Ha stressed. The MONRE proposes three changes to the current Land Law’s provisions on land recovery by the State. The first change is to increase cases of land recovery for socio-economic development for national or public interests to cover also recovering land, especially land plots at advantageous positions, from state agencies, non-business units and state enterprises under plans on relocation of production and business establishments and state agencies from inner cities. Particularly, the MONRE recommends allowing allocation or lease of land for implementation of projects on socio-economic development for national or public interests not through auction of land use rights or bidding for selection of investors. Once the ministry’s proposal is approved, investors may themselves negotiate with land users on transfer of land use rights, if they so wish. The second amendment is to establish a mechanism for handling cases in which investors and land users cannot reach agreement on acquisition, lease or contribution of land for implementation of production and business projects. The third change is to add some other cases in which land recovery will be decided by the Government. Under the 2013 Land Law, provincial-level People’s Committees may decide on land prices serving land allocation, land lease and compensation for land recovery by the State. Meanwhile, the competence to decide on land recovery from households and individuals is vested with district-level administrations. According to the MONRE, such provisions lead to delayed and impractical determination of land prices. To address this issue, the MONRE suggests empowering district-level People’s Committees to decide on land prices in case of recovering land from, or allocating or leasing land to, households and individuals. The ministry also recommends adding representatives of households and individuals whose land is recovered to land pricing councils.